When yesterday’s Atlanta snowfall turned my carpool ride home with 4 children from a 25 minute cruise into a 5-hour crawl, my son brought up his current literature assignment, Ray Bradbury’s Fahrenheit 451. I’d never read the book. I missed a lot of classics as a kid, so I like to benefit from my kids’ assignments. Fahrenheit 451 portrays a dystopia where fire crews are dispatched to burn all books. The really relevant part in the context of the Atlanta snow is that, in Fahrenheit 451, everything in the cities moved at warp speed. Cars raced through the boulevards at over a hundred miles an hour – so fast that billboards had to be 200 feet long for a driver to see anything but a blur. Nobody had the time or inclination to develop relationships. TV was family. This is what moving too slowly can do to one’s perspective. Get me out of here! This gridlock reminded me of a conversation I had with my 4th grade daughter the other day. She mentioned someone she knew who speaks VERY slowly. I told her how I had, on occasion, worked with lawyers who speak very slowly. I explained how frustrating that could be because lawyers charge by 6 minute increments. The slower they speak, the more aware you become of how much you’re paying them. My daughter asked me – how much do lawyers charge? I said, anywhere from a hundred dollars to more than five hundreds dollars an hour. This brought to mind my five years as a Writer for Peter Jennings. Reporters on ABC World News Tonight with Peter Jennings, as with any network news program, would have a time limit on their pieces. Often they’d write too many words to fit into the allotted time. So they’d read their words quickly – speed up their delivery. Jennings would have them do it over, more slowly. Never speed up your delivery, he would tell them. Words delivered quickly are harder for the ear to follow. Jennings would rather trim the words than accelerate the pace. Listen to any great speaker. They do the same. Which brings me to one of the most important books written in a long time – one you have to read slowly. Kahneman is the Nobel Prize Winning economist and psychologist who became famous for his work demonstrating how poorly people can be at predicting what will make them happy. That’s partly because they use the fast-thinking fast-judging part of their brain too often – the part he calls System One. System Two is the part of your brain that struggles through the tough questions and is often underutilized. System Two thought takes time. It takes practice and hard work. If you read Thinking, Fast and Slow thoroughly, slowly, it will make you hyperaware of how your brain works. It will make your decision making process more effective. You will realize when your lazy System One part of your brain is in control, and force your insightful System Two part of your brain to steer you in the right direction. My car was idling for hours, but these previous 600 words were not idle musings. As my System 1 part of the brain was writing, My System 2 part of the brain was also working, without my knowledge. I just realized, gridlock is an opportunity. 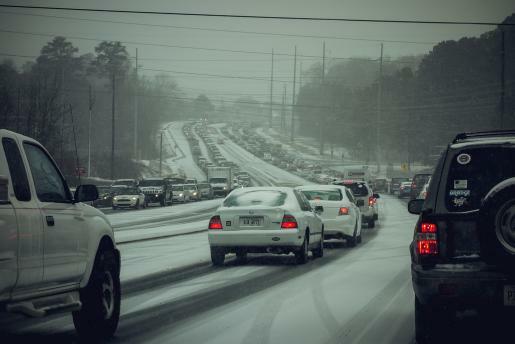 Next time there’s a snowstorm in Atlanta, or the prospect of gridlock anywhere, I’m not getting in a car without a Book. A Book on Tape. One for the whole family. And so – in my effort (to turn this light breeze) have this light breeze of a story produce a powerful wave, I invite you, my readers, especially teachers, librarians, and the type of people who, had you lived in a society like Farenheit 451, would have memorized a classic book to keep it alive for a better future – I ask all of you – to do the following. Take a moment and post your book recommendation on my Facebook page here. Please let us know why you think your choice is a great choice for the whole family. I will follow up with a story compiling as many of your insights as possible – with input from a few surprise guests whose judgment on good books is highly valued. And that is how I hope to create (The Family Book Wave) a Family Book Wave.